The case of French national Florence Cassez held in Mexico continues to be redolent of a similar expat scenario that was encountered through an earlier trial held in the Italian college town of Perugia. The latter proceedings involved the notorious trial of Amanda Knox, which featured irreconcilable testimony sure to convict, which ended up making it all but impossible to bring in a credible verdict. 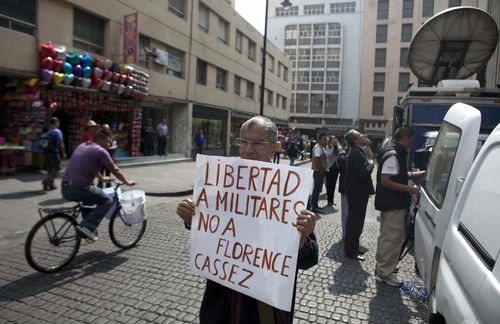 Similarly, your January 24th article, “Florence Cassez Released in Mexico”, failed to identify the extent of political influence that was used in the somewhat suspicious circumstances related to the French national, Cassez. At the time of the crime, her former boyfriend, Israel Vallarta, head of the vicious Mexican gang, the Zodiacs, had confessed to kidnapping charges. The alleged violation of due process in the Cassez case worked solely in her favor and her recent release came with the election of new presidents of the two countries involved, France’s Francois Hollande and Mexico’s Enrique Peña Nieto. The cases of Amanda Knox and Florence Cassez both subsequently forged a new wave of political optimism for future relations between the native countries of the convicted expat citizens. From an original sentence of 96 years, to a reduced one of 60 years, to a complete acquittal, Cassez found herself in an enchanted post-trial life as France welcomed her as a national hero after she had served seven years of jail time and unremitting publicity surrounding a court trail that produced a continuous harvest of citations and television titterings. Emphasis was placed on the vindicating sentiments coming forth from both France and Mexico in praise for the Mexican democratic system, somehow bypassing the acknowledgement of the seven years it eventually took to avoid coming to a decision and the chronic blatant violation of human rights by the Mexican police. Both cases (Cassez’s acquitted and the degree of culpability that her ex-boyfriend, Israel Vallarta, was detained in jail) have put an almost unbearable strain on the Mexican legal system. Much of the impact of the political pressures placed on the courts by both countries by the courtroom process up to now made the outcome, as France relentlessly pressured the Mexican judicial system, in its efforts to deliver justice to the earlier convicted felon. Diplomatic tensions may have peaked in 2011 when Mexican government authorities subsequently cancelled a high-profile cultural event in Paris, presumably due to lingering tensions over the Cassez case. Often, the political motive of a wealthy and powerful country to free one of its citizens coming from a nation wielding decisive power has proved to be a deliberative factor in determining the overall relationship between the two litigating countries— Yet, Vallarta still sits in jail, awaiting to be tried, after Cessaz had gone through after surviving all of the Supreme Court hearings. One can ask if justice has been served or if this is a convenient faux-resolution by global political actors with far bigger fish to fry?